Join other art and travel fans for Travellati Tours' Picasso's Pyrenees Tour and experience the places and people that inspired Pablo Picasso. We'll even meet Picasso and his friends Georges Braque, Fernande Olivier, and Manolo Huguet in their usual "haunts" in Céret, France, via theatrical pop-up theater created just for Travellati Tours. Having dinner at an outdoor restaurant in Céret, France, Picasso's home-away-from-home. Join us for the Cherry Festival in Céret in May 2018, complete with parades, bands, catalan and sardane dances, cherry stoning and spitting competitions (you know you want to! ), choreographed show, choral concert, and open air banquet. Not to mention cherry tart, cherry clafoutis, cherry beer, and anything else that can be made with cherries! 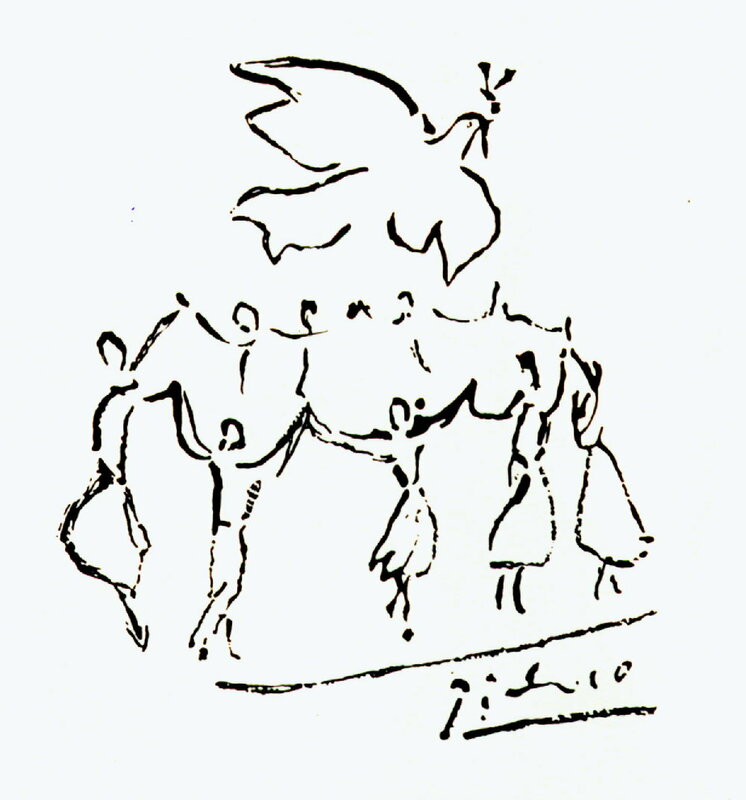 Fêtes de Céret 1912, Pablo Picasso. The Pont du Diable (Devil's Bridge) in Céret. Lacemakers in a square in Céret during the Fall festival. Fishing boats in the port of Collioure, near Céret. A Paquito, a crowd-surfing event. Dancing the Sardane in Céret. Espadrilles in the colors of Collioure. The lovely little town of Céret in the Catalonian Pyrenees near the Mediterranean became a mecca of Cubism and welcomed successive waves of painters to its lovely climate and low-key atmosphere. Picasso, Braque, Matisse, Gris, Soutine, Dufy, Cocteau, Chagall, Dubuffet, Tzara, and many others were attracted by its native artist, Manolo, and especially by Manolo’s friend and wealthy art patron, Frank Haviland. It was here that Picasso and Braque developed analytical cubism (those pictures in brown and grey with lots of lines in different directions and hard-to-recognize subjects). This group became known as the School of Céret. 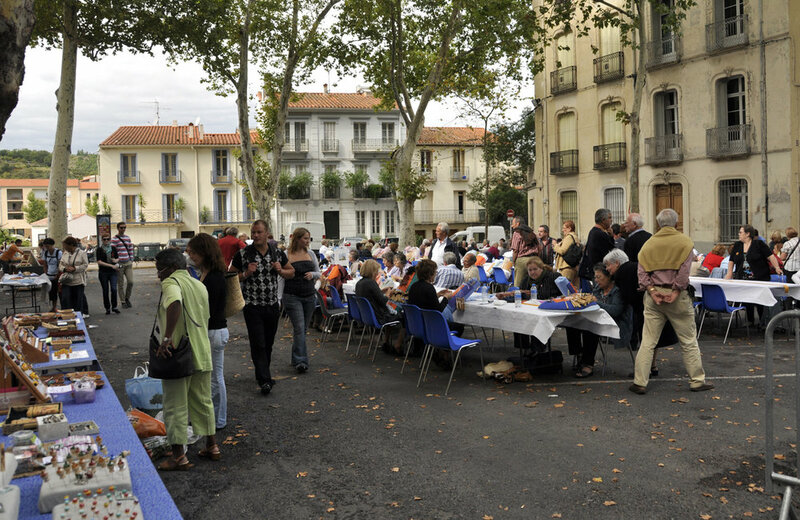 Come join us as we stroll the shady streets of Céret; visit the Modern Art Museum with its permanent collection of Picasso, Matisse, Soutine, Gris, Chagall, Dufy, and locals Manolo and Maillol; we'll visit the Musée Maillol in lovely Banyuls on the Meditteranean; the art museum in Perpignan; and the museum dedicated to fellow Catalonian Salvador Dali in his hometown of Figueres, Spain. On the way to Figueres, we'll stop at the last remaining espadrille factory in the Pyrenees where we can watch these wonderfully comfy shoes being made. On our last weekend, we'll fully participate in the Cherry Festival including dancing the sardane in the streets, singing catalonian songs, and listening to brass bands play Paso Dobles; and of course we'll eat, drink, and shop for local delicacies and specialties, such as authentic espadrilles and bags woven in the vibrant colors of the port of Collioure. Salvador Dali arriving in Céret with Amanda Lear. We'll stroll over to the Pont du Diable, the arched and hooked stone bridge painted by many artists; and to Les Capucins, the monastery that heir Frank Haviland refurbished and to which he invited all his artist friends, such as Picasso, Braque, and Gris. We'll take a side trip to the Catalonian town of Perpignan and the charming port of Collioure, where Matisse and Derain spent several summers painting. Les Capucins, Lee Kemble. Photo Travellati Tours. 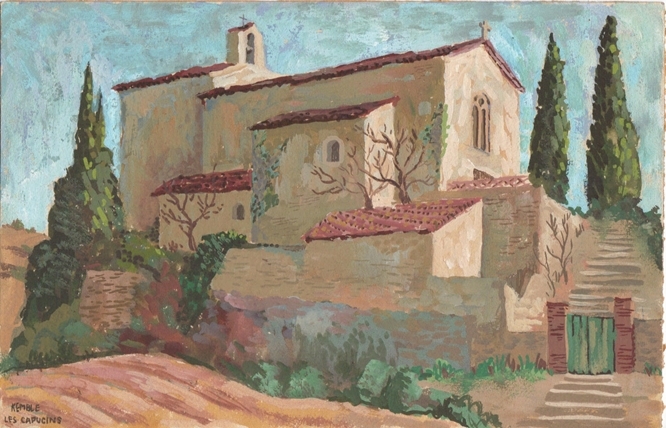 Le couvent des capucins à céret, Soutine. And I'll share some of the stories that Frank Haviland told my father, Lee Kemble, about the famous artists he had known and fostered. Frank Haviland, left rear, and Lee Kemble, right front, on the road to Les Capucins. Come join us, we'd love to have you!